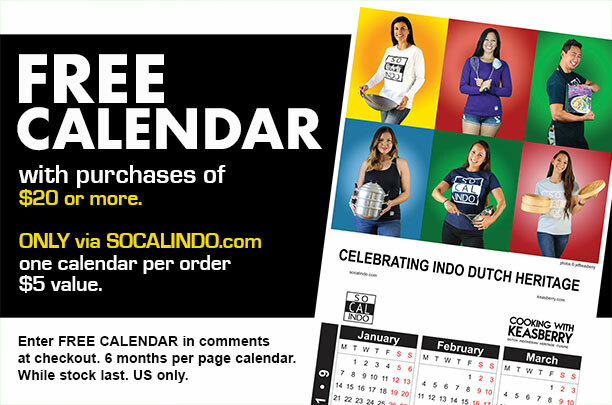 A unique Indo Dutch heritage calendar, featuring SoCal Indo-Dutch Americans loving their Indo Dutch food culture and apparel is offered for free. This limited edition calendar will be included with your SoCal Indo Apparel order placed via this site. We preserve our heritage and show our Indo Pride wearing the SoCal Indo Apparel It shows a sense of identity in a fast changing world for future generations. Indo Dutch culture provides warm hospitality to all. Especially for this new year we designed a unique SoCal Indo, Indo Dutch Heritage calendar that will be included for FREE with every order of SoCal Indo Apparel of $20 or above placed via this site only. Are you curious to explore the Indo Dutch cuisine or want to reconnect? Most Indo cookbooks are in Dutch. You don’t speak Dutch and want to retrieve that special recipe, once deemed lost forever? Then Indo Dutch Kitchen Secrets is for you! It also makes for a great gift.